​The past 500 years have seen human-induced species loss that rivals or surpasses the great extinctions of ages past both in terms of magnitude and rate of declines. Most species live in rapidly fragmenting communities, and loss of one species has subsequent impact on the persistence of others through trophic cascades. It is therefore important to know which species are most at risk, the ecosystem services they provide, and to develop strategies for protection. The lab currently studies four main groups of threatened taxa: primates, galliformes, large carnivores including bears, and small carnivores. A significant problem for Southeast Asia is that basic population data is largely absent for many threatened species. Conservation measures often start with population estimates, which for many species viability estimates are still basically guesswork. Thus, one of the lab's primary goals is to start putting scientific rigour into population estimates, along with habitat models to try to estimate global population sizes and trends of those populations. In conjunction with this, at the site level, adequate techniques often do not yet exist for estimating abundance, and thus the lab is involved in developing new techniques, adapting established techniques, and testing and comparing survey methods to best estimate abundances of these threatened taxa. In addition, the programme has an interest in seed dispersal, a critical ecosystem function for forest dynamics that many of these focal species provide, particularly primates, bears, birds, and small carnivores such as civets. Finally, there is also a new focus on trophic level issues starting with small carnivores and the role they play in ecosystem function and the factors that control their population dynamics, such as top-down control by large carnivores and bottom-up control through food availability such as fruit and rodents. The Green Peafowl (Pavo muticus) is one of the most threatened bird species in Southeast Asia. It was uplisted to "endangered" on the IUCN Red List in 2009 due to hunting pressure and habitat destruction. Several wild groups have been discovered in the relative safety of temple compounds in Shan State, Myanmar. Credit: N. Sukumal, 2016. 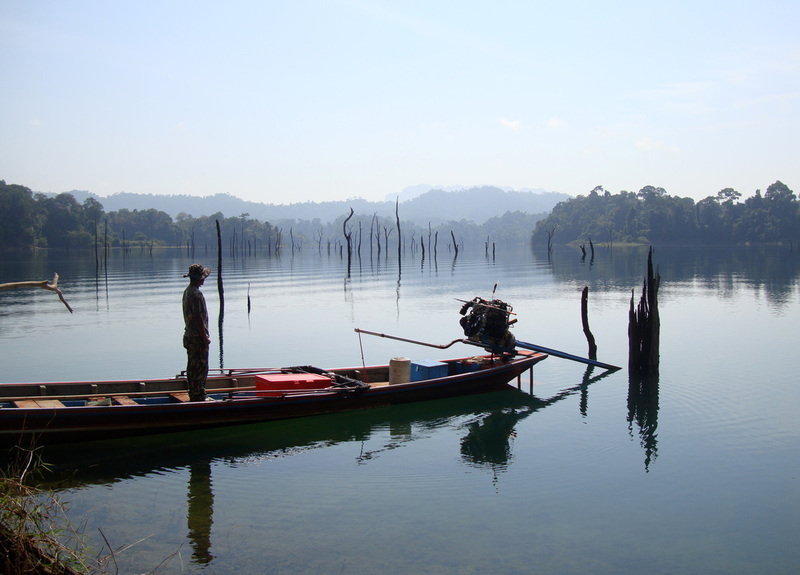 The Rajjaprapha Hydroelectric Dam is one of many large-scale development projects that have negatively affected important habitat for threatened species in the region. Findings from the study of this ecosystem include lessons learned that can be applied in future decision-making processes. Credit: G. Irving, 2016. Approximately half of Southeast Asians are living in urban centres, and the proportion of urban dwellers is growing by over 2% per year. The unplanned consequence of this migration is increased energy demand and rapid expansion of urban sprawl, with subsequent degradation of habitat. Much of the lost urban habitat is unprotected coastal estuary and marshland of conservation importance. The Chao Phraya river valley has already lost an endemic ungulate, Shomburgk's Deer (Rucervus schomburgki), and on Bangkok's outskirts, one of the last remaining wintering grounds for critically endangered Spoon-billed Sandpiper (Calidris pygmaea) and endangered Nordmann's Greenshank (Tringa guttifer) will soon be converted into a solar generation project. As suburban wetlands are drained and "beautified", habitat-dependent species such as Asian Golden Weaver (Ploceus hypoxanthus) are under increased threat. At the same time, governments are making massive investment into large-scale infrastructure projects, with particular emphasis on regional trade, transport, and hydropower. Ports and highways are planned within crucial coastal habitats and along key avian migration routes. Roads are already posing dispersal barriers for mammals in protected areas and can accelerate deforestation and habitat fragmentation. Dams oftentimes inundate irreplaceable lowland habitat. Important conservation priorities include measuring and predicting the impact on ecosystems and their biota, assessing the ecological value of affected habitats, and improving planning processes for reduced environmental impact. Primates are highly diverse in terms of ecology, habitat use, social structure, and tolerance to human disturbance. They thus offer models for understanding some of the challenges species are facing in rapidly changing landscapes such as in Southeast Asia where human impact on natural habitats is among the highest observed in the tropics. The Conservation Ecology Program is working with partners at several levels in studying primate biology. At landscape scale, research focuses on investigating the status of different primate species in relation to macro-habitat and its level of human disturbance. State-of-the-art survey methods are used to estimate primate densities and to provide information to interpret other survey results. At the local scale, research focuses on several ecological aspects such as: a) animal ranging by using different home range estimators in both two and three dimensions. Territoriality in relation to resources availability and species density is investigated using fidelity index; b) Species socioecolgy mostly focuses on monogamy, polyandry, and fission-fusion in relation to resources availability and conspecific density. Primate function as predators, mostly on the understory passerine community, is considered to be affected by human disturbance and habitat degradation; and c) primates are among the important seed dispersal agents in tropical forest, crucial for forest regeneration. The ecological role and detailed ranging patterns of many primates’ species in South-East Asia is still unknown, its understanding will provide valuable information for building seed dispersal networks in Asian forests and for developing more effective conservation actions in these habitats. 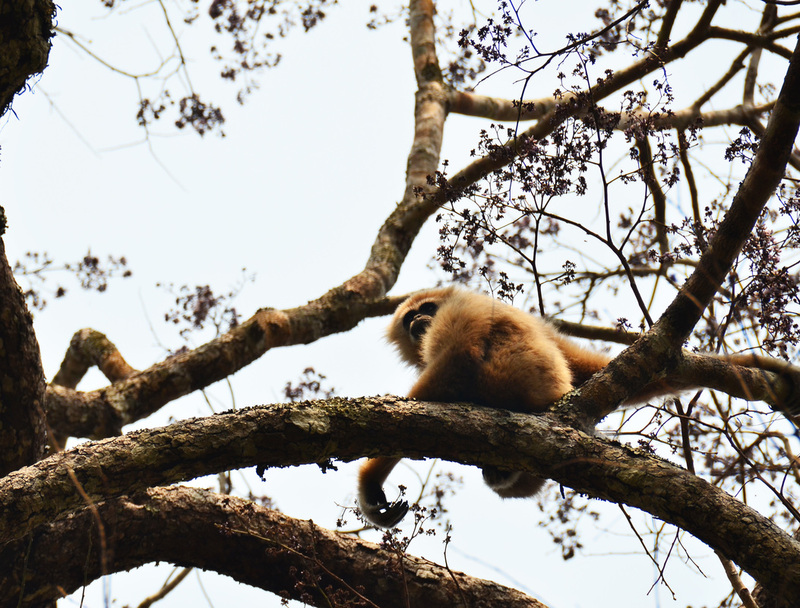 Usually restricted to mature evergreen forest, White-handed Gibbons (Hylobates lar) have recently been observed in the dry mosaic (dry dipterocarp forest and mix deciduous forest) of Huai Kha Khaeng Wildlife Sanctuary, Western Thailand. An ongoing study of ranging behaviour, social structure, and function as seed dispersers was started in 2010. Credit: T. Savini, 2013. In northeast Thailand, density of naturally unmarked Siamese Fireback (Lophura diardi) was estimated, for the first time, by analysing camera trap data using both count-based and presence/absence-based methods. Credit: S. Suwanrat, 2010. 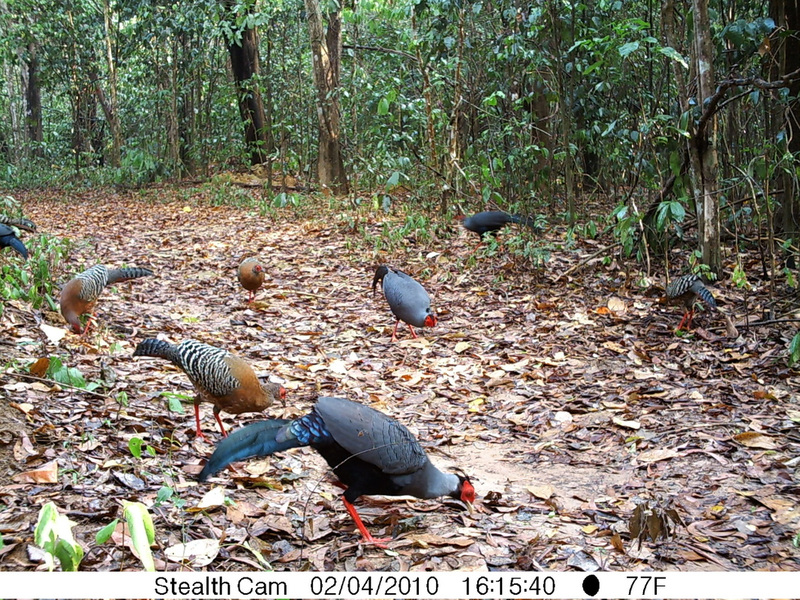 With 25% of their species threatened, Galliformes are under major pressure from human disturbance. Relatively well studied in China and the Indian subcontinent, basic data is still lacking on most of the species/genera inhabiting southeast Asia, which impedes the effectiveness of conservation management efforts. Important conservation questions include distribution status, population trends, and hot-spot areas for species protection. The Conservation Ecology Program is addressing Galliforme conservation in a number of ways. This includes regional, landscape-level investigations of species distribution and status using predictive mapping, and using up-to-date survey methods adapted to both loud calling and cryptic species. Studies are underway, and have been completed, on key threatened species from all the available genera, investigating ecological parameters such as nesting, predation avoidance, ranging behaviour and micro- and macro-habitat selection. When possible, comparison of the current status with past datasets is needed to define population/species trends, and remote sensing is used to look at long-term habitat loss, degradation, and to highlight where further survey or strengthened management/outreach should take place. ​Most mammalian research focuses on large, charismatic predators. However, Southeast Asia is also a vitally important region for the conservation of meso- and small mammalian carnivores, with several endemic and globally threatened species. A recent status and distribution assessment suggests that Thailand is likely of comparably higher global significance for the conservation of these species as they are still relatively abundant and recorded across several protected areas. Hence, the major questions of interest among conservationists include the distribution and status of meso- and small mammalian carnivores, localities requiring strengthened protection to ensure their survival, and ecosystem services provided. It is increasingly evident that the best hope for some species lies in the conservation of unprotected or underprotected habitats which lack large apex predators. In these systems, small carnivores assume the position of the top carnivores. Wetland habitats are particularly crucial for survival of species such as Small-clawed Otter (Aonyx cinereus), Smooth-coated Otter (Lutrogale perspicillata), Hairy-nosed Otter (Lutra sumatrana), Fishing Cat (Prionailurus viverrinus), Flat-headed Cat (Prionailurus planiceps), and Otter Civet (Cynogale bennettii). Habitat loss and degradation is likely threatening these species survival as well as the overall integrity of their ecosystems through trophic cascade. 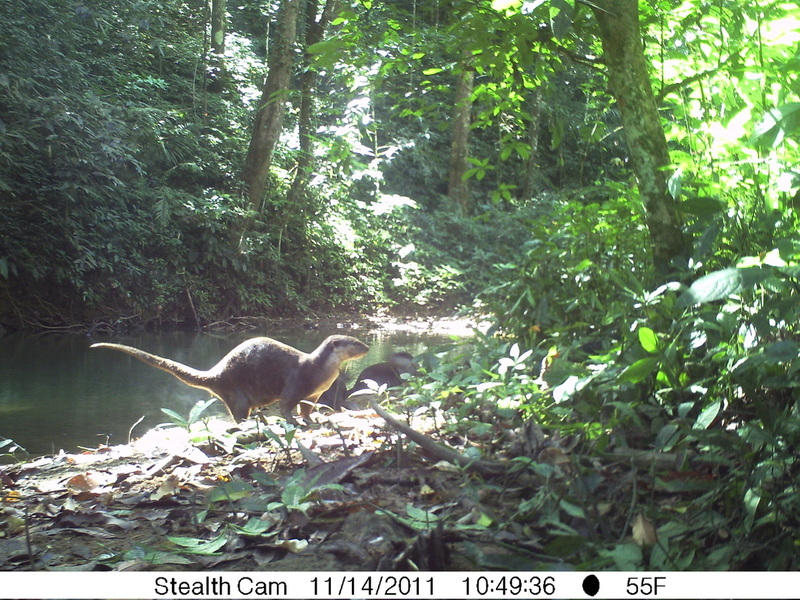 Much of the Programme's recent work has focused on conducting camera-trap, key-informant interviews, and animal sign surveys in underprotected wetlands, coastal habitats, and urban areas. Ecological studies and interactions among sympatric mammal species are also studied. In terrestrial habitats in locations such as dipterocarp mosaics of eastern Cambodia and forest fragments across the region, small and meso-carnivores serve as top predators. As with systems hosting large carnivores, it is important to understand the interactions among species and influence of dynamic resource availability in determining species habitat use and population trends. Yet, basic ecology of most of small carnivores, in particular threatened species such as Large-spotted Civet (Viverra megaspila), are still lacking in most parts of their ranges. The Conservation Ecology Program is addressing these questions in several locations. Both in wetland and terrestrial habitats, the programme is also working to identify long-term conservation hotspots and baseline data for population assessments, which should also benefit these species regionally. The Smooth-coated Otter (Lutrogale perspicillata) is a vulnerable species that persists in forests and coastal areas of Southeast Asia. This group was photographed in Thung Yai Naresuan Wildlife Sanctuary, Thailand. Credit: W. Chutipong, 2011.